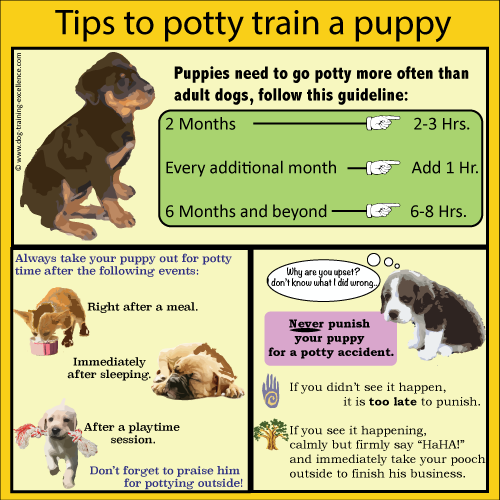 Potty training your new puppy may be the greatest reason why so many families don’t want a dog or have surrendered their current dog. Below are some important tips on how to potty train your puppy. First and most important, do not trust your puppy! No matter how cute & sweet your puppy may be, you have to remember to keep enforcing the rules that you expect your pup to learn. If we desire a well behaved, trained and a well dis-positioned puppy that’s living life to its fullest than it’s up to US to put in the time & effort it takes to create this. In the initial stages of training your puppy, it is crucial to keep diligent watch of all the little things. You must understand your puppy so creating that special bond will enable much faster results through the training processes. Remember, re-enforcing our expectations with positive reinforcement is the best way to teach! For most of us, potty training is one of the first and most important tasks we desire to accomplish in our training. A lot of us use blocking methods, wall gates, crates, etc. to block off or restrict areas in our house that we desire to keep safe and/or clean. The biggest mistake some of us make is allowing our untrained puppy to wander the house freely. If we do this, we shouldn’t be shocked when we find an accident or if we get frustrated because we found another chewed up shoe. As responsible pet owners, we have to invest the time it takes to create the best regimen for our beloved pets to learn. Again, you can’t trust a puppy so it is our responsibility to create the best environment they will succeed at. An applicable bible verse that can be applied to not only ourselves, but also our children and/or pets: “Lead me not into temptation…” (Matt. 6:13). So, it is vital for us to create an environment where our pet’s will not be vulnerable to act upon bad behaviors. We may not be able to prevent all the accidents but we can do a lot by just setting up the right environment where the rules are easily defined and the rewards are positive and worth while. The greatest success in potty training is to have open lines of communication with your puppy. If your puppy knows how to alert you by a simple whine, cry, bark or better yet– ring of a bell than you have most of your work done! The goal for almost every dog owner is to train your puppy to communicate with you so their needs can be fulfilled. Now, the second greatest success may surprise you! Some think assume that giving your puppy the opportunity to potty is bad but don’t be so quick to believe that. Observing your puppy’s behaviors before they have the ability to communicate is crucial as you want to know what their tendencies are right before they have that need to go to the bathroom! If they don’t know how to alert you so they squat and go than there’s a golden opportunity to verbally correct your puppy in a positive way. If your puppy is pacing back and forth or sniffing more than usual, they are probably looking for a good spot to mark. The moment you see your pup squatting, make a verbal correction such as “No!” or “bad dog”. You never need to yell or loose your temper. Consistency will pay off in itself if you create the right environment and establish a bond with your dog. You can also use other cues such as clapping our hands or a soft stomp with our feet to alert them with the verbal command “No”. The severity of our correction should be dependent on the sensitivity of our puppy so remember to expect accidents and to not take your frustrations out on a pup who is learning. Some pups are extremely sensitive so just a soft but firm soft “No” will stop them immediately. And, some pups are a little more strong-willed and a very loud “NO!” would be appropriate for their disposition. Treats are a great way to show your gratitude and praise for good behavior. We recommend having a small bag of treats to give to your pup by your door. If you are consistent and persistent your English Golden will learn that going inside is wrong and outside is good. Another important part of potty training your puppy is to never correct a puppy after the fact. Until they get older, they have a very short memory and can’t remember why you are yelling at them. Also, never “rub your dog’s nose in it.” English Cream Golden Retrievers are very sensitive and smart. They want to please you. If you physically correct them, you are simply going to make your Golden Retriever scared of you. You will lose their trust and continued training will be hampered. We never allow our pups to use the restroom on hard surfaces. We train our pups to use the restroom only on pine shavings, grass or dirt. They are trained from even before they are weaned to do this. On the other hand, there are certain areas of a home that are very much a pitfall for puppies. These are areas that appear very much like grass or dirt. Areas they tend to favor for accidents include carpet, rugs, laundry piles, doggy beds, etc… Whenever they are in these areas they will believe they are on a potty spot and be more prone to potty. Watch them carefully in these areas. If your puppy does have an accident, clean it up very well to take the smell out using a carpet cleaner like Nature’s Miracle Urine Destroyer. Dogs have an incredible sense of smell and if they can smell their potty they will be much more prone to potty there again and again. If they are pottying on the same spot constantly another helpful thing you can do is to feed them on the potty spot. They naturally do not want to sleep or eat where they potty so that can help discourage them. The beginning is very important when you take them home. Make sure you teach them where to potty. Take them to the exact same spot to potty every time. Take your Golden out the exact same door every time. Use the same key word when pottying your puppy (like “Let’s Go” or “Potty”). Treat when you potty them & buy some pine shavings and sprinkle it around where you want them to use the restroom. Consistency is key. 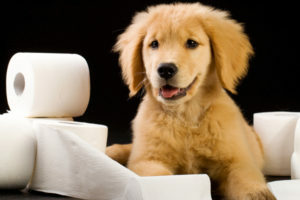 Following the tips in this blog will ensure your puppy has the potty training down in no time.